Since Glo the leading data offer network operatop Slashed Down Monthly Data Plans by 50%. The Old Glo data Plan 2GB for N500, and 4GB for N1000 is Now slashed down on The New Glo Data Plans N1000 = 2GB and N2000 = 4.5GB. Everbody has been looking for alternative of recent i got over 6 request to please provide better data offer solutions. I have a good news for you, We are going back to the formal MTN data offer trick. This article will walk you through on how You can Activate mtn double data offer on your MTN sim card and get your next Mtn Data plan subscription doubled. Before now, We do maneuver this offer by tweaking IMEI of a new smartphone on Our smartphones in other to activate the MTN double data offer. Now, you didn't need to tweak IMEI on your device before you can activate the offer. Well, the good news is that MTN 100% double data offer is still rocking like ever before. That means if you subscribe 1mb you will be given 2mb. DOUBLE to 131 as a text message. PROMO to 131 as a text message. Finally, Send FREE to 131 as a text message. Note: When you send Double and Promo to 131, you will receive a error response. Just ignore it and continue with the activation. After sending First message ➤ 1st reply "Sorry, The Command you have entered is incorrect." After sending Second message ➤ 2nd reply "Y'ello! Your request has been received and is being processed. You will receive a response shortly. Please don't resend your request. Thank you!" After sending Third message ➤ 3rd reply "Dear Customer, Enjoy data offers on MTN Deal zone, Dial *131*1#". Note: The third message determines your eligibility for the offer, After You've received the last or third message, You can proceed to subscribe to any Mtn data plan of your Choise and it will be doubled immediately. Please don't subscribe if you didn't receive the 3rd message. 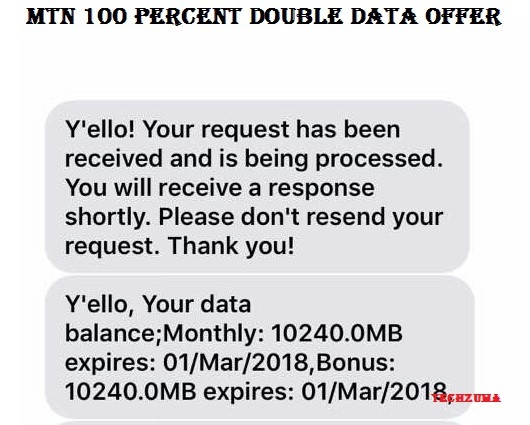 The second technique, You can use to activate this 100 percent double data offer is to buy and register a new MTN SIM card. You'll automatically be opted into the double data offer. MTN will double your data each time you subcribe. Note: Mtn double data offer is valid for 3 months, and is very much important now that MTN has increased the price of her data plans. Dont jump stright to big data plan, You should test if the double data offer you have just activated on sim works, by subscribing to daily data plan of 50MB for N100 and see if it works. If it works succesfully then you can then subscribe to higher data plans to get your data doubled. To check Your MTN data balance: Dialling *131*4# or send 2 to 131 as a text message.